The Guyra Hospital Auxiliary won the Volunteer Team Excellence in Service Provision category at the Northern Tablelands Health Cluster awards. 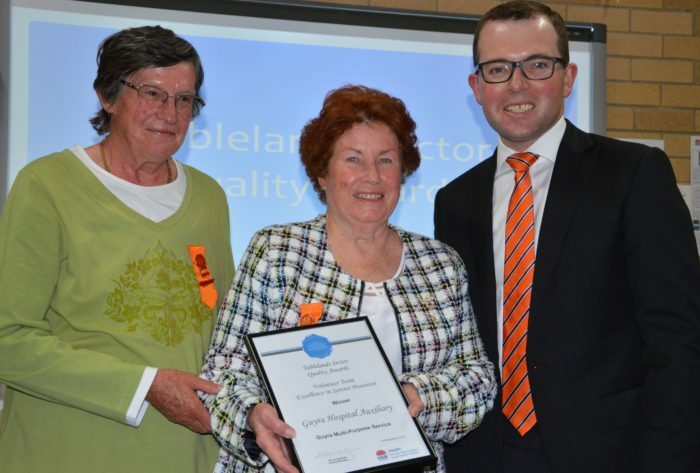 Northern Tablelands MP Adam Marshall presented auxiliary representatives Dianne Burey, left, and Patricia Fields with their award. THE Guyra Hospital Auxiliary has been named the top volunteer group for excellence in health service provision across the Northern Tablelands health sector. President Patricia Fields and its immediate past president Dianne Burey accepted the award from Northern Tablelands MP Adam Marshall at a ceremony in Armidale on Monday. Mr Marshall presented the awards to health professionals across the region including to nursing and staff team leaders, project designers, volunteers and consultants for the best of programs and people from the Inverell, Guyra, Glen Innes, Armidale and Tenterfield health areas. Mr Marshall said the power of people to lend a hand and give extraordinary amounts of their time and effort on a voluntary basis, particularly to health services and to the people seeking healthy outcomes, needed to be acknowledged and the Tablelands Sector awards were one way of doing that. An administration officer with the Guyra Multi-Purpose Service, Alisa Kennedy, was also named one of the five finalists in the individual category for excellence in staff service provision. The Guyra auxiliary was honoured for the extensive number of events and activities it organised to benefit the local multi-purpose service. This included street stalls, book fairs and raffles that provided for everything from new equipment and hospital bed products, to craft supplies, to entertainment – and even to supplying the bird seed to encourage birds into the Guyra MPS gardens so patients could enjoy them too. Mr Marshall said the Hunter New England Area Health Service Tablelands Sector Quality Awards recognised achievements in health projects and by health staffers and others and celebrated some outstanding efforts to bring better health standards to clients and patients. Tablelands Sector general manager Wendy Mulligan said while it was very difficult to choose winners, the full list of finalist nominations displayed exceptional service provision programs and she was very proud of all the staff who had participated.